A Chitungwiza man has been sentenced to an effective three-year jail term after he was convicted for participating in violent protests that rocked Chitungwiza and left a trail of destruction in January. John Musona and Remember Furamera appeared before Chitungwiza magistrate Mrs Winfilelder Tiatara charged with public violence. 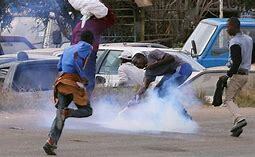 The pair, through their lawyer Miss Tinomuda Shoko of Zimbabwe Lawyers for Human Rights, pleaded not guilty. Musona was convicted after the State established a prima facie case against him as Sergeant Charlene Mbwachena positively identified him during the time when he was destroying cars at the police premises. Initially, he was sentenced to four years in prison but one year was conditionally suspended. His co-accused, who sustained a bullet wound during the protests was acquitted after the State failed to link him to the commission of the crime. Prosecutor Mr Edmond Ndambakuwa proved that on January 14, Musona was among the people who barricaded the Mharapara road with stones and throwing missiles to the police who were near that road. Musona and others who are still at large went to Vehicle Inspection Department at Makoni where they pulled down the security fence and burnt vehicles that were there. Musona and others also proceeded to Chitungwiza Police Station where they also pulled the security fence and burnt vehicles which were parked within the premises belonging to individuals. He was easily identified by Sgt Mbwachena because he was previously arrested at the same police station over a different matter.